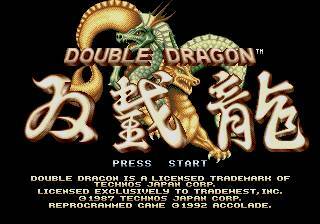 This is a hack of Double Dragon for the Sega Genesis. It fixes two problems of this port. 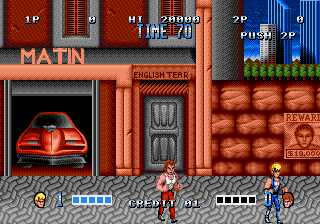 It reduces the walking speed of enemies to make the game much more like the arcade game. Also, throwable objects such as cardboard boxes and barrels will not break after two throws. The value of throws was set to FF (255) so they should never break during normal gameplay. These changes make the games much more enjoyable and fix two major flaws of this port. Version 1.1 tightens the screen scrolling when walking right and also reduces the frequencies of attacks from enemies to less annoying levels. Version 1.2 removes the frequencies of attack portion of the hack as it makes the enemies practically braindead. This comes with two patches. One without the screen scrolling patch, and one with it. There is a bug in the screen scrolling patch which is explained in the readme. This is why the feature is now optional. Also, the screen scrolling also works when going left, not just right.